Rate this project Pat Riehecky has announced the release of Scientific Linux 6.6, the latest update of the distribution built from source package for Red Hat Enterprise Linux 6.6, with additional software meant for use in scientific and academic environments: "Scientific Linux 6.6 i386/x86_64. Major differences from SL6.5: OpenAFS has been updated to version 1.6.10 from openafs.org; X.Org Server features a new ABI. Users of proprietary drivers may experience issues with the X server loading due to changes between X.Org Server 1.13 and 1.15. Users of the 32-bit iSCSI utilities on x86_64 systems may experience multilib complaints. The 32-bit iSCSI utilities are not provided by upstream on x86_64 platforms. We have removed them from 6.6 to follow their behavior." Here is the brief release announcement, with further details available in the release notes. Download: SL-6.6-x86_64-2014-11-05-Install-DVD.iso (4,113MB, SHA256, pkglist). Live CD/DVD images of Scientific Linux 6.6 are also available. Pat Riehecky has announced the release of Scientific Linux 7.0, a distribution compiled from the source code for Red Hat Enterprise Linux 7: "Scientific Linux 7.0 x86_64 released." Scientific Linux differs from Red Hat Enterprise Linux and CentOS in that the project enhances the system with extra software applications and utilities: "elrepo-release - this package contains the ELRepo driver yum repo and GPG key; epel-release - this package contains the EPEL driver yum repo and GPG key; OpenAFS - this package contains the OpenAFS driver and client utilities; SL_gdm_no_user_list - this package will disable the GDM user list in the chooser; SL_enable_serialconsole - will setup a serial console for login; SL_no_colorls - will disable the automatic colorized ls output; sl-bookmarks - replaces redhat-bookmarks and removes upstream branding...." Read the brief release announcement and check out the more detailed release notes for further information. Download: SL-7-x86_64-DVD.iso (4,019MB, SHA256, pkglist). Pat Riehecky has announced the availability of the first beta build of Scientific Linux 7.0, a distribution compiled from the source code for Red Hat Enterprise Linux 7 and enhanced with extra applications for scientific computing: "Today we are announcing a beta release of Scientific Linux 7. Changes since our last update: updated sl-release now correctly requires Coreutils for the post script; yum-cron, installed by default, now behaves in the same manner as yum-autoupdate; yum-conf-extras provides the SL Extras repository tracking TUV's Extras; yum-conf-hc provides the de-branded upstream hardware test toolkit; a standard DVD image is now provided, it should fit on a normal-sized DVD." Read the rest of the release announcement for a list of things not yet included in the release. More detailed information is available in the release notes. Download: SL-7-x86_64-DVD.iso (4,015MB, SHA256, pkglist). Pat Riehecky has announced the availability of an early alpha release of Scientific Linux 7, a distribution compiled from the source code for Red Hat Enterprise Linux 7: "Fermilab's intention is to continue the development and support of Scientific Linux and refine its focus as an operating system for scientific computing. Today we are announcing an alpha release of Scientific Linux 7. We continue to develop a stable process for generating and distributing Scientific Linux, with the intent that Scientific Linux remains the same high quality operating system the community has come to expect. This alpha does not include many historic SL addons. We would like to open discussion on which specific packages and utilities should be added to SL 7." Read the release announcement and release notes for further information. Interested alpha testers can download either the full 6.2 GB ISO image (which can be transferred to a USB storage device) or the small "netinst" image (SHA256): SL-7-x86_64-DVD.iso (6,377MB), SL-7-x86_64-netinst.iso (392MB). 2014-02-08 Distribution Release: Scientific Linux 6.5 "Live"
Urs Beyerle has announced the release of "Live" editions of Scientific Linux 6.5, a distribution built from source packages for Red Hat Enterprise Linux 6.5 but enhanced with extra software applications for use in academic and scientific environments: "Scientific Linux 6.5 LiveCD, LiveMiniCD and LiveDVD are officially released. Changes since 6.4: software based on Scientific Linux 6.5; CUPS, Pidgin, Brasero, Qt, Gcalctool, gdisk, LFTP, spice-client, minicom and nc were removed from 'LiveCD' to save disk space. Notes: the live images are based on the Fedora LiveCD tools; if you install LiveCD to hard drive, the installation of the live image is done by Anaconda similar to the normal SL6 installation, all changes done during LiveCD usage are lost; you can install LiveCD on an USB stick with persistent changes using liveusb-creator included in sl-addons." See the full release announcement for further information. Download (SHA256): SL-65-x86_64-LiveDVD.iso (2,564MB, includes GNOME, IceWM, KDE), SL-65-x86_64-LiveCD.iso (698MB, GNOME only), SL-65-x86_64-LiveMiniCD.iso (514MB, IceWM only). Connie Sieh has announced the release of Scientific Linux 6.5, a distribution built from source package for Red Hat Enterprise Linux 6.5 with extra software designed for use in scientific and academic environments: "Scientific Linux 6.5 is officially released for i686/x86_64. As a reminder, the SL6x repository always points to the most recent release. The SL6x repository has been updated to SL6.5 at this time. Users of the Scientific Linux 6x repository should run 'yum clean expire-cache'. This should allow yum to notice the updated metadata within the 6x repository. Major differences from Scientific Linux 6.4: OpenAFS has been updated to version 1.6.5.1 from openafs.org - this package may have some issues, please note there is a possibility for system panic under certain conditions; alpine 2.10 - updated to more recent version (from Fedora); yum-autoupdate-2 6.3 - bug fixes for extra, useless reporting, remove the obsolete augeas lense." Read the release announcement and release notes for more information. Download: SL-65-x86_64-2014-01-27-Install-DVD.iso (4,276MB, SHA256). Pat Riehecky has announced the release of Scientific Linux 5.10, a distribution built from source packages for Red Hat Enterprise Linux 5.10 and enhanced with a variety of academic and scientific software applications: "Scientific Linux 5.10 is officially released for i686/x86_64." Users upgrading to this version should pay special attention to the MySQL package: "Scientific Linux 5.10 provides updated versions, specifically versions 5.1 and 5.5, of the MySQL packages as software collections. In order to migrate from MySQL 5.0 to 5.5, you must first update to MySQL 5.1. Note that the MySQL 5.1 packages are not supported and are provided only for the purposes of migration to MySQL 5.5. You should not use MySQL 5.1 on any of your production systems. As a result of this update, we will not issue any more security advisories for the MySQL 5.0 packages." Read the release announcement and release notes for further information. Download: SL.510.110513.DVD.x86_64.disc1.iso (4,140MB, MD5). 2013-04-20 Distribution Release: Scientific Linux 6.4 "Live"
Urs Beyerle has announced the availability of live CD and DVD images with the recently released Scientific Linux 6.4: "Scientific Linux 6.4 LiveCD, LiveMiniCD and LiveDVD are officially released. They are available for 32-bit and 64-bit systems and come with following window managers: LiveMiniCD - IceWM, LiveCD - GNOME, LiveDVD - GNOME, KDE, IceWM. Software was added from RPMForge, EPEL and ELRepo to include additional file system support (NTFS, ReiserFS), secure network connection (OpenVPN, VPNC, PPTP), file system tools (dd_rescue, ddrescue, GParted, gDisk), and better multimedia support (GStreamer, FFmpeg, Flash plugin). Software: Linux kernel 2.6.32, X.Org Server 1.13.0, GNOME 2.28, Firefox 17.0.5, IceWM 1.2.37, LibreOffice 3.4.5, KDE 4.3.4." More details in the release announcement. Download (SHA256): SL-64-x86_64-LiveCD.iso (695MB), SL-64-x86_64-LiveDVD.iso (2,348MB), SL-64-x86_64-LiveMiniCD.iso (496MB). Pat Riehecky has announced the release of Scientific Linux 6.4, a distribution built from source package for Red Hat Enterprise Linux 6.4 and enhanced with software suitable for use in scientific and academic environments: "Scientific Linux 6.4 is officially released. The OpenAFS kernel module package has changed - with SL 6.0 we started packaging the OpenAFS client's kernel module according to the guidelines from TUV's Driver Update Program. Due to unanticipated changes with the 6.3 kernel, we've had to revisit the process. With the 6.4 release, we modified the packaging to provide a dedicated build of the module for each minor SL release, instead of one kernel module (kmod) for all SL6 kernels. Since the EL kernel ABI is supposed to be kept stable within a minor release, this should avoid the problems some SL users experienced." Read the rest of the release announcement for other important notes. Download: SL-64-x86_64-Install-DVD.iso (4,142MB, SHA256), SL-64-i386-Install-DVD.iso (3,510MB, SHA256). 2012-08-27 Distribution Release: Scientific Linux 6.3 "Live"
Urs Beyerle has announced the release of live CD and DVD images for Scientific Linux 6.3: "Scientific Linux 6.3 LiveCD, LiveMiniCD and LiveDVD are officially released. They are available in 32-bit and 64-bit variants and come with following window managers: LiveMiniCD - IceWM; LiveCD - GNOME; LiveDVD - GNOME, KDE, IceWM. Software was added from rpmforge, epel and elrepo (see EXTRA SOFTWARE) to include additional file system support (NTFS, ReiserFS), secure network connection (OpenVPN, VPNC, PPTP), file system tools (dd_rescue, ddrescue, GParted, gDisk), and better multimedia support (FFmpeg, Flash). Changes since 6.2: add boot parameter eject which ejects CD/DVD at shutdown." See the full release announcement for more details. Links to download the live CD and DVD images: SL-63-i386-LiveCD.iso (698MB, SHA256), SL-63-i386-LiveDVD.iso (2,308MB, SHA256), SL-63-x86_64-LiveCD.iso (695MB, SHA256), SL-63-x86_64-LiveDVD.iso (2,348MB, SHA256). Connie Sieh has announced the release of Scientific Linux 6.3, an enterprise-class distribution built from source package for Red Hat Enterprise Linux 6.3: "Scientific Linux 6.3 i386/x86_64 is now available. Release notes: OpenAFS updated to version 1.6.1; yum-conf-rpmfusion has been added by popular request, end users must verify their own eligibility and license compliance before use; yum-conf-sl6x - updated GPG key list, CERN's key is now listed here too; xorg-x11-server changed to remove TUV's support URL; sl-bookmarks now includes links to useful non-SL provided resources; revisor support has been added for the upstream changes in Anaconda; sl-revisor-configs - the Kickstart files provided have been renamed for simplicity...." See the release announcement for a full list of changes. Download: SL-63-i386-Install-DVD.iso (3,482MB, SHA256), SL-63-x86_64-Install-DVD.iso (4,112MB, SHA256). Pat Riehecky has announced the availability of the first beta version of Scientific Linux 6.3, a distribution built from source packages of Red Hat Enterprise Linux and enhanced with extra applications useful in academic environments: "There should be no expectation that a 'yum' upgrade to SL 6.3 will work. A new install is the recommended method to move from 'sl6rolling'(this alpha release) and the released 'SL 6.3'. Major changes the upstream vendor made: LibreOffice - OpenOffice.org has been replaced with LibreOffice. The LibreOffice packages 'provide' the right packages to maintain compatibility for Kickstart and yum installs; Anaconda - Anaconda now alerts users to the beta status of a release when it is tagged appropriately, upstream has added this functionality and we are taking advantage of it for the beta cycle...." Read the full release announcement. Download the DVD images: SL-6.3-i386-DVD.iso (3,464MB, SHA), SL-6.3-x86_64-DVD.iso (4,093MB, SHA). Pat Riehecky has announced the release of Scientific Linux 5.8, a distribution rebuilt from source packages for Red Hat Enterprise Linux 5.8 and enhanced with extra software and tools useful in academic environments: "We would like to announce the immediate availability of Scientific Linux 5.8." Besides upstream updates some of the changes compared to version 5.7 include: "Intel wireless firmware (ucode) updated to a more current version; Java updated to the latest security package; the 1.4.14 release of OpenAFS, this version fixes a minor locking bug; Ralink wireless firmware updated to a more current version; yum-utils updated to current version; lsb_release -a now reports the same as SL6...." Read the release announcement and release notes for further details. Download: SL.58.041912.DVD.i386.disc1.iso (4,195MB, MD5), SL.58.041912.DVD.x86_64.disc1.iso (4,170MB, MD5). 2012-02-17 Distribution Release: Scientific Linux 6.2 "Live"
Urs Beyerle has announced that, following the recent release of Scientific Linux 6.2, live images with the distribution are now also available: "Scientific Linux 6.2 live CD, live mini CD and live DVD are officially released. They are available for 32-bit and 64-bit architectures and come with following desktop or window managers: live mini CD - IceWM, live CD - GNOME, live DVD - GNOME, KDE, IceWM. Changes since 6.1 Live: software based on Scientific Linux 6.2; kmod-ndiswrapper removed; system-config-printer added; gDisk added; Flash plugin installer by default. Software: Linux kernel 2.6.32, X.Org Server 1.7.7, IceWM 1.2.37, GNOME 2.28, Firefox 3.6.26, Thunderbird 3.1.18, OpenOffice.org 3.2.1, KDE 4.3.4. Read the complete release announcement for additional details. Quick links to download the live CD and DVD images: SL-62-i386-LiveCD.iso (695MB, SHA256), SL-62-i386-LiveDVD.iso (2,287MB, SHA256), SL-62-x86_64-LiveCD.iso (699MB, SHA256), SL-62-x86_64-LiveDVD.iso (2,327MB, SHA256). Pat Riehecky has announced the release of Scientific Linux 6.2, a distribution built from source packages for Red Hat Enterprise Linux 6.2 and enhanced with extra software for use in scientific and academic environments: "Scientific Linux 6.2 is now available for download. Differences from 6.1: Anaconda - added the Scientific Linux install classes, DVD installs do not ask for the network unless needed; OpenAFS updated to version 1.6.0, this packages includes a patch to disable NAT pings to avoid a race condition; livecd-tools and liveusb-creator updated from upstream to version 13.4; sl-release - removed Troy Dawson's GPG key, added CERN's GPG, added EULA; yum-autoupdate has had PRERUN and POSTRUN scripts added for more flexibility; the yum-conf-* packages now require yum-fastestmirror by popular request.... See the release announcement and release notes for more information. Download: SL-62-i386-2012-02-06-Install-DVD.iso (3,600MB, SHA256), SL-62-x86_64-2012-02-06-Install-DVD.iso (4,213MB, SHA256). Pat Riehecky has announced the availability of the first release candidate for Scientific Linux 6.2, a distribution built from source packages for Red Hat Enterprise Linux 6.2 and enhanced with extra applications useful in academic environments: "Scientific Linux 6.2 Release Candidate 1 i386/x86_64 is now available for testing. Differences from version 6.1: Anaconda - added the Scientific Linux install classes, DVD installs do not ask for the network unless needed; OpenAFS - updated to version 1.6.0-97, this packages includes a patch to disable NAT pings to avoid a race condition; livecd-tools, liveusb-creator - updated from upstream to version 13.4, added support for Scientific Linux 6.2; redhat-rpm-config - changed to recognize Scientific Linux as an enterprise Linux; sl-release - added CERN's GPG...." Here is the full release announcement. Download the installation DVD images from here: SL-62-i386-2012-01-31-Install-DVD.iso (3,600MB, SHA256), SL-62-x86_64-2012-01-31-Install-DVD.iso (4,213MB, SHA256). 2011-11-02 Distribution Release: Scientific Linux 5.7 "Live"
Urs Beyerle has announced the release of the "Live" edition of Scientific Linux 5.7, a set of installable live CD, live DVD and mini live CD images based on Red Hat Enterprise Linux 5.7: "With a little delay I can announce the release of Scientific Linux 5.7 live CD/DVD. Please note that the SL 5.7 live CD/DVD were built with the old build environment used for all SL 4.x SL 5.x live CD/DVD releases so far. The Scientific Linux live CD/DVD is a bootable CD/DVD that runs Linux directly from CD/DVD without installing. It is based on Scientific Linux 5.7 (SL57), which is recompiled from Red Hat Enterprise Linux 5 sources. Software: Linux kernel 2.6.18-274.3.1.el5, openAFS client 1.4.14, X.Org 7.1, ALSA sound libraries 1.0.17, GNOME 2.16.0 (standard desktop), OpenOffice.org 3.1.1, Firefox 3.6.23, KDE 3.5.4 (only on live DVD)...." Here is the release announcement. Download the GNOME live CD images from here: livecd_SL57_gnome.iso (697MB, MD5), livecd64_SL57_gnome.iso (698MB, MD5). Connie Sieh has announced the release of Scientific Linux 5.7, a free enterprise-class distribution built from source packages for Red Hat Enterprise Linux 5.7, with extra packages suitable for use in academic environments: "Scientific Linux 5.7 has been released for i386 and x86_64 architectures." Here are some highlights from the release notes: "Alpine 2.02, a tool for reading, sending, and managing electronic messages; Aufs 20090202, a stackable unification file system; gnuplot 4.2.6; Intel wireless firmware (ucode) Intel wireless; R 2.13.1, a language and environment for statistical computing and graphics; updated kernel modules for XFS, a highly scalable, high-performance journaling file system; updated kernel modules for OpenAFS and NDISwrapper; updated Sun/Oracle Java packages to 6u26...." Download: SL.57.090911.DVD.i386.disc1.iso (4,180MB, MD5), SL.57.090911.DVD.x86_64.disc1.iso (4,184MB, MD5). Troy Dawson has announced the availability of the first beta release of Scientific Linux 5.7: "The first beta of Scientific Linux 5.7 has been released. This release has all the new updated packages from the upstream vendor's Update 7, as well as the security and fastbugs up to yesterday. We have network install images, and DVD images, no CD images are available at this time. Changes since alpha 1: Anaconda has been updated to the version released with Update 7, we have added the normal Scientific Linux patches to the install; Alpine was updated to version 2.02; Intel wireless driver iwlwifi-6000 was updated to version 9.221.4.1; Oracle's Java was updated to version 1.6.0_26; R was updated to version 2.13.1." The release announcement. Download: SL.57.081811.DVD.i386.disc1.iso (4,187MB, MD5), SL.57.081811.DVD.x86_64.disc1.iso (4,161MB, MD5). Scientific Linux 6.1, a free "clone" of Red Hat Enterprise Linux 6.1 enhanced with extra software, has been released: "Scientific Linux 6.1 is now officially released and available." Some of the changes since 6.0 include: "A whole new graphical theme called 'Edge Of Space'; we pulled the 'fastbugs' and 'testing' repositories out of the repository file that comes with sl-release, they are now in their own RPM called yum-conf-sl-other. Added several packages to Scientific Linux that are not found anywhere on the Enterprise releases: IceWM - a fast and small X11 window manager; OpenAFS - a distributed file system...." Read the release announcement and release notes for more details. Download: SL-61-i386-Install-DVD.iso (3,607MB, SHA256), SL-61-x86_64-Install-DVD.iso (4,184MB, SHA256). Installable live CD (with GNOME) and live DVD images (with GNOME, KDE and IceWM) are also available: SL-61-i386-LiveCD.iso (699MB, SHA256), SL-61-x86_64-2011-07-27-LiveCD.iso (699MB, SHA256). Troy Dawson has announced the availability of the first of the two planned release candidates for Scientific Linux 6.1: "The first release candidate for Scientific Linux 6.1 has been released. Everything is looking very stable. We will let release candidate 1 (RC1) sit for a week and a half so people can find any last-minute bugs. If everything goes well we expect RC2 on July 26, with the final release later that week. Changes since beta 2: sl-indexhtml - fixed minor typos, de-DE, ja-JP, fr-FR translations; sl-release - updated yum configurations to point to 6.1 instead of 6rolling; sl-revisor-configs - added iso_label and iso_basename to revisor.conf entries, changed all configurations in conf.d to be 6x instead of 6.0; yum-conf-sl-other - changed fastbugs and debuginfo from 6rolling to $releasever." Read the brief release announcement for a more complete changelog. Download: SL-61-i386-2011-07-14-Install-DVD.iso (3,607MB, SHA256), SL-61-x86_64-2011-07-14-Install-DVD.iso (4,184MB, SHA256). 2011-07-08 Distribution Release: Scientific Linux 5.6 "Live"
Urs Beyerle has announced the release of live CD and live DVD variants of Scientific Linux 5.6: "About two weeks after the official release of Scientific Linux 5.6, the Scientific Linux live CD/DVD 5.6 can now be downloaded for 32-bit and 64-bit processors. Features: can be installed to local hard disk; runs from USB key; changes can be stored persistently on an external device; can be mounted over NFS (diskless client). Software: Linux kernel 2.6.18, OpenAFS client 1.4.14, X.Org 7.1, ALSA libraries 1.0.17, GNOME 2.16.0 (standard desktop), GIMP 2.2.13, OpenOffice.org 3.1.1, Firefox 3.6.18, Thunderbird 2.0.0.24, KDE 3.5.4 (only on live DVD). Software added compared to standard Scientific Linux: FUSE NTFS-3G (read/write NTFS support), ntfsprogs, GParted.... Read the rest of the release announcement for more information. Quick links to download the live CDs: livecd_SL56_gnome_2011-07-06.iso (697MB, MD5), livecd64_SL56_gnome_2011-07-06.iso (698MB, MD5). On a related note, the second beta of Scientific Linux 6.1 was also released today. Troy Dawson has announced the availability of the first beta release of Scientific Linux 6.1, a Red Hat-based distribution with extra software likely to be of use in academic and scientific environments: "The first beta of Scientific Linux 6.1 has been released. All of the recompiled packages have passed our tests to our satisfaction. We do not expect the packages that we get from the upstream vendor to change. Although we see a few tweaks and changes before release candidate, these should all be minor. I believe we have made it past the last major hurdles. Changes since alpha 2: libguestfs - recompiled against a different repository so that it better matched our golden image; qemu-kvm - recompiled against several different repositories, our version does not require several libX libraries...." See the release announcement for full details. Download: SL-61-i386-2011-07-01-Install-DVD.iso (3,607MB, SHA256), SL-61-x86_64-2011-07-01-Install-DVD.iso (4,184MB, SHA256). On a related note, live images containing Scientific Linux 5.6 are now ready for testing. Troy Dawson has announced that the second alpha release of Scientific Linux 6.1, a distribution built by compiling the source packages for Red Hat Enterprise Linux 6.1, is ready for testing: "The second alpha release for Scientific Linux 6.1 has been released. All of the packages have gone through much more testing. There are still a couple of packages we are investigating, so we are still in alpha stage and not beta stage. Changes alpha 1: redhat-logos - updated syslinux-splash.png and plash.xpm.gz, added the SVG files into the source tar ball; yum-autoupdate - fix a security issue with the tmp configuration files; added our changes to the updated report and plymouth package; mksh - we got it to compile; fence-virt - had to be recompiled with the old qmf packages removed from the repository; elrepo-release updated to the latest version...." See the release announcement for more details. Download: SL-6-i386-2011-06-23-Install-DVD.iso (3,609MB, SHA1), SL-6-x86_64-2011-06-23-Install-DVD.iso (4,187MB, SHA1). Troy Dawson has announced the stable release of Scientific Linux 5.6, a distribution built from source packages for Red Hat Enterprise Linux 5.6, with extra packages that could be useful in scientific and academic environments: "Scientific Linux 5.6 has been released for both i386 and x86_64 architectures. It has a new graphical theme called 'Atom Shine' provided by Shawn Thompson. Scientific Linux release 5.6 is based on the rebuilding of RPMs out of SRPMs from Enterprise 5 Server and Client. It also has all errata and bug fixes up until May 13, 2011." Some of the extra application, tools and drivers added the distribution include Alpine, IceWM, Intel wireless firmware, Sun Java, KDEEdu, multimedia support, OpenAFS, R, YumEx and many others. Please read the release announcement and release notes for further information. Download: SL.56.061711.DVD.i386.disc1.iso (4,167MB, MD5), SL.56.061711.DVD.x86_64.disc1.iso (4,172MB, MD5). Troy Dawson has announced the availability of the second (and likely last) release candidate for Scientific Linux 5.6: "Scientific Linux 5.6 RC2 is now available. We have pushed out the latest update to Scientific Linux 5.6. There are both network install images as well as CD and DVD images. If there are no problems, this will be the final release, there will be no further changes. Changed since RC1: GDM Login screen background was changed to have the 'Atom Shine' blue background. After four years the 'EaseOfBlue' GDM theme is now blue; release notes and READMEs were updated; on the distribution servers everything is copied over to the 56 directory, there should be no links pointing to 5rolling. If there are no problems we expect to release Scientific Linux 5.6 on Tuesday 21 June 2011." The release announcement. Download: SL.56.061711.DVD.i386.disc1.iso (4,167MB, MD5), SL.56.061711.DVD.x86_64.disc1.iso (4,172MB, MD5). Troy Dawson has announced that the first release candidate for Scientific Linux 5.6 is out and ready for testing: "Scientific Linux 5.6 RC 1 is now available. We have pushed out the latest update to Scientific Linux (SL) 5.6. Changed since beta 3: SL 5.6 has a new graphical theme called 'Atom Shine'; sl-release and yum-conf were updated to point to 56 instead of 5rolling; R was updated to 2.13.0; on the distribution servers there is now a directory 56, for i386 and x86_64 there are links to 5rolling, this does not mean that 56 is released, it is only in release candidate, It is set up this way so that we can test. Known issues: the GDM login screen still has the old graphics instead of the new Atom Shine graphics, this will be fixed in the next release candidate. We expect SL 5.6 RC2 out in two weeks." The release announcement. Download: SL.56.060811.DVD.i386.disc1.iso (4,167MB, MD5), SL.56.060811.DVD.x86_64.disc1.iso (4,172MB, MD5). Troy Dawson has announced the availability of the first alpha release of Scientific Linux 6.1, a distribution built from source packages for Red Hat Enterprise Linux 6.1 and enhanced with extra application useful in academic environments: "The first alpha for Scientific Linux 6.1 has been released. This release has all the new updated packages from the upstream vendors (TUV) update 1. It will install, and it appears to work, but no major testing has been done. Changes from 6.0 (in addition to TUV changes): Shawn Thompson created a whole new graphical theme for Scientific Linux 6 called 'Edge Of Space'; we pulled the fastbugs and testing repositories out of the repository file, they are now in their own RPM called yum-conf-sl-other - this is done to fix the problem of people checking the fastbugs during the install. Read the rest of the release announcement for further details. Download: SL-61-i386-2011-05-31-Install-DVD.iso (3,559MB, SHA256), SL-61-x86_64-2011-05-31-Install-DVD.iso (4,115MB, SHA256). Troy Dawson has announced the availability of the second beta release of Scientific Linux 5.6, a Red Hat-based distribution built from source packages from Red Hat Enterprise Linux 5.6: "Scientific Linux 5.6 beta 2 is now available. Changed since beta 1: updated kernel during the install; there were a few packages that needed to be rebuilt due to library dependencies, we have added all the security and fastbug updates up until May 10, 2011. Known bug: for i386 DVD, x86_64 DVD, and x86_64 network install, after the packages are all installed, you will get the following error: 'An error occurred while installing packages...' It is safe to hit 'OK', and the install will finish successfully. If you look in the install log you will find that the JDK post-install script did not run successfully." Here is the brief release announcement. Download: SL.56.051311.DVD.i386.disc1.iso (4,169MB, MD5), SL.56.051311.DVD.x86_64.disc1.iso (4,176MB, MD5). Troy Dawson has announced the release of Scientific Linux 4.9. This is the project's legacy 4.x release, based on Red Hat Enterprise Linux 4.9, and is likely to be the last official version in the series that features Linux kernel 2.6.9, glibc 2.3.4, GCC 3.4.6, X.Org 6.8.2, GNOME 2.8 and KDE 3.3. From the release announcement: "Scientific Linux 4.9 has been released. Scientific Linux 4.9 contains almost two years of security and bug fixes. There are no new features or packages, but it is a nice stable release. Scientific Linux release 4.9 is based on the rebuilding of RPMs out of source RPMs from Enterprise 4, including Update 9. It also has all errata and bug fixes up until April 19, 2011." See also the release notes for a detailed list of changes, security and bug fixes. As always, the distribution can be updated to the latest version via the usual channels. For those who need fresh installation media, a 6-CD installation sets for i386 and x86_64 architectures are available for download from the Scientific Linux download servers. 2011-03-09 Distribution Release: Scientific Linux 6.0 "Live"
Urs Beyerle has announced the release of Scientific Linux 6.0 "Live" edition, a set of live media built from the Red Hat-based Scientific Linux 6.0: "Scientific Linux 6.0 live CD/DVDs are officially released. They are available for the 32-bit and 64-bit platforms and come with following window managers: LiveMiniCD - IceWM; LiveCD - GNOME and IceWM; LiveDVD - GNOME, KDE and IceWM. Software was added from RPMforge, EPEL and ELRepo to include additional file system support (NTFS, ReiserFS), more secure network connection (OpenVPN, VPNC, PPTP), and several rescue and file system tools (TestDisk, dd_rescue, ddrescue, GParted). For SL6 the way how the live CD was built has completely changed; it is now based on Fedora LiveCD Tools. If you install the live CD to hard drive, the installation of the live image is now done by Anaconda, similar to the normal SL6 installation." Read the release announcement and visit the project's home page to learn more. Quick links to download the live CD images: SL-60-i386-2011-03-07-LiveCD.iso (687MB, SHA256), SL-60-x86_64-2011-03-07-LiveCD.iso (693MB, SHA256). Troy Dawson has announced the final release of Scientific Linux 6.0, a distribution built from source packages for Red Hat Enterprise Linux 6, but with extra software for use in academic environments. "Scientific Linux 6.0 has been released for both the i386 and x86_64 architectures." Some of the changes and features in this release include "The final release only has the same packages that were originally released by upstream vendor, all security and bug-fix errata are in their respective repositories; we have reduced the number of extra packages we put in Scientific Linux 6; there is no 'contrib' repository; we have added several packages to Scientific Linux that are not found anywhere in the upstream release, including IceWM, OpenAFS, Revisor, Live USB Creator, YUM auto-update, external YUM repositories..." Read the brief release announcement and the detailed release notes for more information. Download: SL-60-i386-2011-03-03-Install-DVD.iso (3,508MB, SHA256), SL-60-x86_64-2011-03-03-Install-DVD.iso (4,040MB, SHA256). The first release candidate for Scientific 6 is ready for download and testing: "We have released the first release candidate of Scientific Linux 6. We are now in a feature freeze and are only fixing bugs. Changed since beta 3: yum-conf-sl6x added - installing it will keep your SL6 system at the latest release, as soon as the next release it out, it will update to it; sl-release - repositories were changed to point to 6.0, mirrorlist was put in the configuration files, but there currently aren't any mirrorlist files; OpenAFS - updated to fix an update bug and removed the option of reporting back to Red Hat; livecd-tools and liveusb-creator - updated to link to the latest live images; redhat-logos - marked as the release version." Read the rest of the release announcement for full details and known issues. Download: SL-6-i386-2011-02-18-Install-DVD.iso (3,508MB, SHA256), SL-6-x86_64-2011-02-18-Install-DVD.iso (4,040MB, SHA256). Troy Dawson has announced the availability of the third beta build of Scientific 6: "We have released the third beta of Scientific Linux 6. It is possible that this is our last beta, so if there is some feature you think we missed, let us know now. Changed since beta 2: SL desktop tweaks - added 'add/remove packages' entry to the KDE menu; OpenAFS first boot now works; LiveUSB Creator now has links to the latest SL6 live CDs; removed the option of reporting back to Red Hat; comps.xml - added group 'spins' which has the revisor and live packages, added group 'repos' which has the external repository packages, these packages are now available for installing during the normal install. Known issues: if you are on a x86_64 machine, install the Adobe repository, and install flash-plugin and/or AdobeReader_enu, you will get AdobeReader_ in addition to what you asked for." Read the full release announcement for details. Download: SL-6-i386-2011-02-11-Everything-DVD1.iso (4,264MB, SHA256), SL-6-x86_64-2011-02-11-Everything-DVD1.iso (4,190MB), SHA256). Connie Sieh has announced that the second beta release of Scientific Linux 6 is now ready for testing: "We have released the second beta of Scientific Linux 6. Changed since beta 1: yum-autoupdate was added, it is installed by default. Changes since Scientific Linux 5: all configurations are now in /etc/sysconfig/yum-autoupdate, nothing depends on this, so it can be removed if desired; SL_no_colorls was added; updated Plymouth rings image with smoother font; Install-DVD - this DVD contains only the packages TUV had on their install DVD, if users install with this DVD they are able to select the updates repository without problems; Everything-DVDs - these are the DVDs we've always released containing the entire DVD release." Read the full release announcement for a list of known issues and plans for the third beta release scheduled for next Friday. Download links: SL-6-i386-2011-01-28-Install-DVD.iso (3,508MB, SHA256), SL-6-x86_64-2011-01-28-Install-DVD.iso (4,040MB, SHA256). After five alpha builds, the first beta release of Scientific Linux 6 is available for download and testing. Scientific Linux is a distribution built by compiling the source packages for Red Hat Enterprise Linux (RHEL) 6 and is currently the nearest of all RHEL "clones" to a stable release. From the release announcement: "We have released the first beta of Scientific Linux 6. Changed since alpha 5: the SELinux OpenAFS problem has been fixed; the mechanism to enforce password authentication has changed, that's now configured in /etc/sysconfig/init - this update reflects that change; we have finished the check of our packages against TUV packages - we check files, permissions, scripts, requires, depends, and a few other checks; with this release we fixed the following packages - elinks, jwhois, perl-CGI-Session, perl-IPC-Run3, perl-Makefile-Parser, perl-Sys-Virt, perl-Test-Memory-Cycle." Interested beta testers can download the installation DVD images from here: SL-6-i386-2011-01-21-DVD1.iso (4,264MB, SHA1), SL-6-x86_64-2011-01-21-DVD1.iso (4,190MB, SHA1). Troy Dawson has announced the availability of the fifth alpha release of Scientific Linux 6: "We have released the fifth alpha of Scientific Linux 6. Changed since alpha 4: external repositories added - Adobe, ATrpms, ELRepo, EPEL, RPMforge - you can add these repositories via yum; updates split into Security and Fastbugs - we were trying to lump all updates (security, bugs and enhancements) into one repository called updates, but in the end, simple is better than complex, so we separated the two and there is now updates/security and updates/fastbugs like it was in Scientific Linux 5; packages added - perl-Sys-Virt, not really added, but it finally built and was put in; OpenAFS fix." More details can be found in the release announcement. Download the installation DVD images from here: SL-6-i386-DVD1.iso (4,265MB, SHA1), SL-6-x86_64-DVD1.iso (4,221MB, SHA1). Troy Dawson has announced the availability of the fourth alpha release of Scientific Linux 6, a distribution built by compiling source packages for Red Hat Enterprise Linux 6, but with extra applications that can be useful in academic environments: "We have released the fourth alpha of Scientific Linux 6. Changed since alpha 3: Red Hat logos change - changed background, changed background on GDM, change KDM theme; Plymouth change - generic (non-graphical) start-up now has blue instead of red; packages added - OpenAFS 1.6.0, liveusb-creator 3.9.2. Known issues: packages that haven't been built, and aren't in the release - perl-Sys-Virt; if you install OpenAFS during the install, you do not get the 'firstboot' screen that asks you which cell you want; we have not put in any external repositories, such as EPEL or RPMforge, we expect to add these when we move to beta." Here is the full release announcement. Download: SL-6-i386-DVD1.iso (4,261MB, SHA1), SL-6-x86_64-DVD1.iso (4,221MB, SHA1). Troy Dawson has announced the availability of the third alpha build of Scientific Linux 6: "We have released the third alpha of Scientific Linux 6. Fixed/changes in alpha 3: SELinux - you no longer get an error about SELinux during the install and the default install has it turned on; NTP error - we believe the NTP error was because of the SELinux problems we were having - when we fixed SELinux, the NTP error went away; package check - we have compared our packages with the upstream vendor's and found several differences; we have rebuilt around 240 packages, resulting in around 360 binary packages that have changed; revisor clean-up and documentation. Known issues: packages that haven't been built and aren't in the release include Ekiga, kdepim-runtime, perl-Sys-Virt. There are no specialized pictures shown during the install." More information about the release can be found in the release announcement and in the detailed release notes. Download: SL-6-i386-DVD1.iso (4,266MB, SHA1), SL-6-x86_64-DVD1.iso (4,226MB, SHA1). Troy Dawson has announced the availability of the second alpha release of Scientific Linux 6, a distribution built from source packages for the recently released Red Hat Enterprise Linux 6: "We have released the second alpha of Scientific Linux 6. You are now able to choose between a variety of installs, such as 'Desktop', 'Basic Server', 'Web Development Workstation', and others. As an extra bonus, 'Minimal' install is actually minimal. We have gotten the following packages to build, and they are in the release: Foomatic, Guile, Hivex, Ruby, TurboGears2. Revisor is now working, you are now able to make your own site. Documentation is better and the release notes are getting better." See the release announcement and release notes for more information. Download: SL-6-i386-DVD1.iso (4,263MB, SHA1), SL-6-x86_64-DVD1.iso (4,223MB, SHA1). Troy Dawson has announced the availability of the first alpha build of Scientific Linux 6, a distribution compiled from the source code of the recently released Red Hat Enterprise Linux 6 and enhanced with extra applications: "We have released the first alpha release of Scientific Linux 6. This first release installs and works. Packages that haven't been built, and aren't in the release include Ruby, Ekiga, Foomatic, Guile, Hivex, TurboGears2... We do not have all of the updates that Red Hat has released. Currently the installer says there is only a 'minimal' install available at the package selection, but if you go into 'Customize now' shows that a normal desktop install is selected - we plan on fixing this. There are no specialized pictures shown during the install, just the one that you see through the whole time - we are attempting to get this fixed. We are planning on SL6 alpha 2 to be released next Friday." The release announcement. Download: SL-6-i386-DVD1.iso (4,264MB, SHA1), SL-6-x86_64-DVD1.iso (4,266MB, SHA1). 2010-06-20 Distribution Release: Scientific Linux 5.5 "Live CD/DVD"
Urs Beyerle has released a new version of the "Live CD/DVD" edition of Scientific Linux, a distribution built from source packages for Red Hat Enterprise Linux, but enhanced with extra applications for use in academic environments: "Scientific Linux Live CD/DVD 5.5 has been released for i386 and x86_64. Features: live CD can be installed to local hard disk; live CD runs from USB key; changes can be stored persistently on an external device; live CD can be mounted over NFS (diskless client). Software: Linux kernel 2.6.18, OpenAFS client 1.4.12, X.Org 7.1, ALSA sound libraries 1.0.17, GNOME 2.16.0 (standard desktop), GIMP 2.2.13, OpenOffice.org 3.1.1, Firefox 3.0.19, Thunderbird 2.0.0.24, KDE 3.5.4 (only on live DVD), Evolution 2.12.3 (only on live DVD)." Here is the complete release announcement. Download: livecd_SL55_gnome_2010-06-17.iso (698MB, MD5), livedvd_SL55_2010-06-17.iso (2,558MB, MD5), livecd64_SL55_gnome.iso (698MB, MD5), livedvd64_SL55.iso (2,623MB, MD5). Troy Dawson has announced the availability of Scientific Linux 5.5, a recompiled variant of Red Hat Enterprise Linux with extra software packages, hardware drivers and other specialist features: "Scientific Linux 5.5 has been released for both i386 and x86_64 architectures. We have added gnuplot 4.2 as well as the iwlwifi 6000 ucode (firmware). The upstream vendor has also added FreeRADIUS 2 and PostgreSQL 8.4, as well as updated OpenOffice.org to 3.1.1. Scientific Linux release 5.5 is based on the rebuilding of RPMs out of SRPMs from Enterprise 5 Server and Client, including Update 5. It also has all errata and bug fixes up until the morning of May 18, 2010." Read the release announcement and release notes for a more detailed list of changes. Download: SL.55.DVD.i386.disc1.iso (4,177MB, MD5), SL.55.DVD.x86_64.disc1.iso (4,293MB, MD5). 2009-11-24 Distribution Release: Scientific Linux 5.4 "Live CD/DVD"
Urs Beyerle has announced the release of the "Live CD/DVD" edition of Scientific Linux 5.4, a distribution rebuilt from source packages for Red Hat Enterprise Linux 5.4 and enhanced with extra scientific and other software: "Scientific Linux Live CD/DVD 5.4 has been released for i386 and x86_64. Features: live CD/DVD can be installed to local hard disk; runs from USB key; changes can be stored persistently on an external device; can be mounted over NFS (diskless client). Software: Linux kernel 2.6.18, OpenAFS client 1.4.11, X.Org 7.1, 3D desktop with Compiz and AIGLX, ALSA sound library 1.0.17; GNOME 2.16.0 (standard desktop), GIMP 2.2.13, OpenOffice.org 2.3.0, Firefox 3.0.15, Thunderbird 2.0.0.22, KDE 3.5.4 (only on DVD)." Here is the brief release announcement. Download: livecd_SL54_gnome.iso (697MB, MD5), livedvd_SL54_2009-11-20.iso (2,565MB, MD5), livecd64_SL54_gnome.iso (689MB, MD5), livedvd64_SL54.iso (2,591MB, MD5). Troy Dawson has announced the release of Scientific Linux 5.4, a distribution compiled from source packages for Red Hat Enterprise Linux 5.4, but enhanced with extra scientific packages, file systems and other software: "Scientific Linux 5.4 has been released for both i386 and x86_64 architecture. There are packages that we used to have to add to Scientific Linux, that are now in Enterprise 5, and so we do not have to add them ourselves. FUSE, and its kernel modules, are now provided by the upstream vendor. The Atheros wireless chipset is now supported by the upstream vendor. We have added the iwlwifi 5150 ucode (firmware), as well as updated the 3945, 4945, and 5000 ucode. Lua has been also been added to the release. Scientific Linux release 5.4 is based on the rebuilding of RPMs out of SRPMs from Enterprise 5 Server and Client, it also has all errata and bug fixes up until November 1, 2009." See the release announcement and release notes for more details. Download: SL.54.110309.DVD.i386.disc1.iso (4,027MB, MD5), SL.54.DVD.x86_64.iso (4,151MB, MD5). 2009-08-27 Distribution Release: Scientific Linux 4.8 "Live CD/DVD"
Urs Beyerle has released a set of live CD/DVD images containing Scientific Linux 4.8, a distribution built from source packages for Red Hat Enterprise Linux, but enhanced with additional software: "Scientific Linux 4.8 Live CD/DVD has been released for the i386 and x86_64 architecture. The Scientific Linux live CD/DVD is a bootable CD/DVD that runs Linux directly from CD/DVD without installing. It is based on Scientific Linux 4.8. Features: can be installed to local hard disk; runs from USB key; changes can be stored persistently on an external device; can be mounted over NFS (diskless client). Software: Linux kernel 2.6.9; OpenAFS client 1.4.7, X.Org 6.8.2, KDE 3.3.1, IceWM 1.2.37, GNOME 2.8.0 (only on DVD), GIMP 2.0.5, Unionfs and Squashfs for read/write live system...." More information can be found in the release announcement. Download: livecd_SL48_kde.iso (686MB, MD5), livedvd_SL48.iso (2,195MB, MD5), livecd64_SL48_kde.iso (671MB, MD5), livedvd64_SL48.iso (2,369MB, MD5). Connie Sieh and Troy Dawson have announced the release of Scientific Linux 4.8, a distribution compiled from source packages for Red Hat Enterprise Linux 4.8, but enhanced with scientific software, a cluster suite, additional file systems and other packages: "Scientific Linux 4.8 has been released. It doesn't have any exciting new features, it is just a nice, stable release. Scientific Linux release 4.8 is based on the rebuilding of RPMs out of SRPMs from Enterprise 4, including Update 8. It also has all errata and bug fixes up until July 20, 2009." Some of the extra software found in Scientific Linux 4.8 include: "915resolution, Alpine, CFITSIO, cluster suite and GFS, FUSE, Unionfs, OpenAFS, Intel wireless firmware and NDISwrapper, JAVA...." See the release announcement and release notes for further details. Download: SL.48.072009.i386.DVD.iso (3,618MB, MD5), SL.48.072009.x86_64.DVD.iso (3,945MB, MD5). 2009-03-28 Distribution Release: Scientific Linux 5.3 "Live CD/DVD"
Urs Beyerle has announced the release of the live edition of Scientific Linux 5.3: "Just one week after releasing Scientific Linux 5.3, I'm pleased to say that Scientific Linux Live CD/DVD 5.3 has been released for i386 and x86_64 architectures. Features: live CD/DVD can be installed to local hard disk; live CD runs from USB key; changes can be stored persistently on an external device; live CD can be mounted over NFS (diskless client). Software: Linux kernel 2.6.18, OpenAFS client 1.4.7, X.Org 7.1, 3D desktop with Compiz and AIGLX, ALSA sound libraries 1.0.17, GNOME 2.16.0 (standard desktop), IceWM 1.2.37, GIMP 2.2.13, OpenOffice.org 2.3.0, Firefox 3.0, KDE 3.5.4 (only on live DVD). Software added compared to standard Scientific Linux: NTFS-3G, ntfsprogs, GParted...." Read the release announcement for more information. Download the live CD or live DVD for your processor architecture: livecd_SL53_gnome_2009-03-23.iso (695MB, MD5), livedvd_SL53_2009-03-23.iso (2,548MB, MD5), livecd64_SL53_gnome_2009-03-23.iso (695MB, MD5), livedvd64_SL53_2009-03-23.iso (2,581MB, MD5). Troy Dawson has announced the release of Scientific Linux 5.3, a distribution built from source software packages for Red Hat Enterprise Linux, but enhanced with additional applications and tools: "Scientific Linux 5.3 has been released for both the i386 and x86_64 architectures. Intel wireless has been updated and works much better. We have added the iwlwifi 3945, and 5000 ucode (firmware), as well as updated the 4945 ucode. Scipy has been added to the release, along with fttw and suitesparse to support it. Numpy was already in the release. Scientific Linux release 5.3 is based on the rebuilding of RPMs out of SRPMs from Red Hat Enterprise Linux 5 server and client, including update 3. It also has all errata and bug fixes up until March 17, 2009." Read the brief release announcement and the detailed release notes for further information. Download: SL.53.031809.DVD.i386.disc1.iso (4,009MB, SHA1), SL.53.031809.DVD.x86_64.disc1.iso (4,122MB, SHA1). Troy Dawson has announced the release of Scientific Linux 4.7, an updated build of the project's legacy version based on Red Hat Enterprise Linux (RHEL) 4: "Scientific Linux 4.7 has been released. It doesn't have any exciting new features, it is just a nice, stable release. Scientific Linux release 4.7 is based on the rebuilding of RPMs out of SRPMs from Enterprise 4, including Update 7. It also includes all errata and bug fixes up until September 03, 2008." Scientific Linux enhances the standard RHEL with a number of applications, including a cluster suite, the FUSE file system, IceWM window manager, Intel wireless firmware, Java, MadWifi, OpenAFS file system and others. For more information please see the release announcement and read the comprehensive release notes. Scientific Linux 4.7 is available for both the i386 and x86_64 architectures and comes in the form of 6 CD images, downloadable from the project's main FTP server and mirrors. 2008-08-15 Distribution Release: Scientific Linux 5.2 "Live CD/DVD"
Urs Beyerle has announced the release of the Live CD/DVD edition of Scientific Linux 5.2, a Red Hat-based distribution enhanced with scientific and educational software: "Scientific Linux Live CD/DVD 5.2 has been released for i386 and x86_64 architectures. New feature: changes can be stored persistently on a storage device like a USB key. Together with the possibility to start the live CD from a USB key, this feature allows you to carry around a portable Scientific Linux live system on a single USB stick. Features: can be installed to local hard disk, runs from USB key, can be mounted over NFS (diskless client). Software: Linux kernel 2.6.18, OpenAFS client 1.4.7, X.Org 7.1, 3D desktop with Compiz and AIGLX; ALSA sound libraries 1.0.14, GNOME 2.16.0 (standard desktop on live CD), KDE 3.5.4 (only on live DVD), OpenOffice.org 2.3.0, Firefox 3.0...." Read the complete release announcement for further information. Download the live DVD images from here: livedvd_SL52_2008-08-14.iso (2,475MB, MD5), livedvd64_SL52_2008-08-14.iso (2,509MB, MD5). Connie Sieh and Troy Dawson have announced the release of Scientific Linux 5.2, a distribution based on Red Hat Enterprise Linux 5.2, but enhanced with extra software and features: "Scientific Linux 5.2 has been released in record time. XFS, the file system, is now officially in Scientific Linux 5.2. XFS is not available during the installation as an option for formatting partitions, but you can install it so that pre-formatted partitions will be recognized. KDEEDU has also been added in Scientific Linux 5.2. This was added mainly because KStars is part of this package, but the other educational programs are also helpful to schools. Alpine has officially replaced Pine in Scientific Linux 5.2. Scientific Linux release 5.2 is based on the rebuilding of RPMs out of SRPMs from Enterprise 5 Server and Client, including update 2. It also has all errata and bug fixes up until June 26, 2008." Read the release announcement and release notes for more information. Download: SL-52-062608-i386-DVD.iso (4,098MB, SHA1). A live edition of Scientific Linux 5.1, a distribution built from Red Hat Enterprise Linux source packages and enhanced with extra scientific software, has been released: "Scientific Linux Live CD/DVD 5.1 has been released for i386 and x86_64 architectures. The Scientific Linux Live CD/DVD runs Scientific Linux directly from CD/DVD without installing. The following editions are available: Mini-LiveCD 32-bit with IceWM; LiveCD 32-bit with GNOME; LiveCD 64-bit with GNOME; LiveDVD 32-bit with GNOME, KDE and IceWM; LiveDVD 64-bit with GNOME, KDE and IceWM. Live CD/DVD features: fully writeable root file system; hardware auto-detection; can be installed to local hard disk; can be installed on USB key; can be mounted over NFS (as diskless client)." More in the release announcement. Download: mini_livecd_SL51...iso (241MB, MD5), livecd_SL51...iso (694MB, MD5), livedvd_SL51...iso (2,380MB, MD5), livecd64_SL51...iso (697MB, MD5), livedvd64_SL51...iso (2,415MB, MD5). Troy Dawson has announced the release of Scientific Linux 5.1, a Red Hat-based distribution with additional software for scientific and educational purpose: "Scientific Linux 5.1 is finally out. This release has the ability to easily make sites (customized Scientific Linux distributions). The ability to make sites was missing from SL 5.0. We also managed to add back some of those packages that didn't make it into SL 5.0, as well as a few packages new for this release. Scientific Linux release 5.1 is based on the rebuilding of RPMs out of SRPMs from Enterprise 5 Server and Client, including Update 1. It also includes all errata and bugfixes up until January 16, 2008." Some of the extra software added to Scientific Linux include 915resolution, Alpine, CFITSIO, dropit, FUSE, Graphviz, IceWM, Intel wireless firmware, Java, MadWiFi, GStreamer plugins, NdisWrapper, NEdit, NumPy, OpenAFS, R and others. Read the release announcement and release notes for a detailed list of features. Download: SL-51-011508-i386-DVD.iso (4,345MB, SHA1). Urs Beyerle has announced the release of the live CD/DVD edition of Scientific Linux 4.5, a set of live media built from source RPM packages for Red Hat Enterprise Linux 4.5: "The Scientific Linux live CD/DVD is a bootable CD/DVD that runs Linux directly from CD/DVD without installing. It is based on Scientific Linux 4.5 (SL45), which is recompiled from Red Hat Enterprise Linux 4 sources (RHEL4 AS Update 5). The following versions of the Scientific Linux live CD are available for download: 'livecd' (fits on a CD-ROM), 'livecd64' (CD-ROM for 64-bit systems), 'livedvd' (fits on a DVD), 'livedvd64' (DVD-ROM for 64-bit systems), 'mini_livecd' (rescue system). Additional feature: live CD/DVD can be installed on local hard disk or USB key and can be mounted over NFS. Latest changes: diskless client - better detection of the network card; GParted added to live CD/DVD...." Here is the full release announcement. Download the live CD images from here: livecd_SL45_kde_2007-10-02.iso (699MB, MD5), livecd64_SL45_kde_2007-10-02.iso (687MB, MD5). Connie Sieh and Troy Dawson have announced the release of Scientific Linux 4.5, a distribution rebuilt from source code for Red Hat Enterprise Linux 4: "Scientific Linux 4.5 has been officially released. This release took a little longer because of changes in the installer. Although you cannot use Scientific Linux 4.5 as a Xen virtual host, it can now be installed as a Xen paravirtual guest. This gives a significant speed increase over fully virtualized guests. We want to thank all those tested, retested, contributed, and worked with the developers. We think the Scientific Linux community is one of the best to work with. We hope you enjoy the release." Here is the brief release announcement. The CD image sets for i386 and x86_64 architectures are available for download from the project's FTP server and its mirrors. Urs Beyerle has announced the availability of a live CD edition of Scientific Linux 5.0: "Scientific Linux Live CD 5.0 has been released for i386 and x86_64 architectures. The Scientific Linux Live CD is a bootable CD that runs Scientific Linux directly from CD without installing. New feature: Live CD can be installed to local hard disk. Major software updates compared to Scientific Linux 4 Live CD: Linux kernel 2.6.18, OpenAFS client 1.4.4, X.Org 7.1, 3D desktop with Compiz and AIGLX, GNOME 2.16.0, OpenOffice.org 2.0.4, Firefox 1.5. Additional features: can be installed on USB key; can be mounted over NFS (as diskless client)." Read the full release announcement and visit the live CD project page for further information. Download: livecd_SL50_gnome_2007-05-25.iso (693MB, MD5), livecd64_SL50_gnome_2007-05-25.iso (696MB, MD5). Connie Sieh has announced the release of Scientific Linux 5.0, a distribution rebuilt from source packages for Red Hat Enterprise Linux 5 and enhanced with a variety of additional applications: "Scientific Linux 5.0 i386 is now available." Some of the extra applications include: "CFITSIO - a library of C and FORTRAN subroutines for reading and writing data files in FITS; FUSE - an implementation of a fully functional file system in a userspace program; Graphviz - graph visualization tools; IceWM - a lightweight window manager; Intel wireless firmware, MadWiFi and NdisWrapper; Java; MP3 support; OpenAFS; R - a language and environment for statistical computing and graphics...." Please read the complete release notes for further details. Download: SL-5.0-050407-i386-DVD.iso (3,802MB, SHA1). Red Hat Enterprise Linux (RHEL) 5 won't be released until the end of February, but if you want to get an idea what to expect, try the latest Scientific Linux 5 alpha live CD or DVD. Built from source packages for RHEL 5, the live CD/DVD set was announced yesterday: "Scientific Linux Live CD and DVD 5.0 alpha has been released for i386. Packages included: kernel 2.6.18, X.Org 7.1, KDE 3.5.4; GIMP 2.2.13, Evolution 2.8.0, OpenOffice.org 2.0.4, Firefox 1.5.0.8, GNOME 2.16.0 (DVD only). On the SL5 alpha live DVD all Client / Workstation RPMs are installed and GNOME is the default desktop. 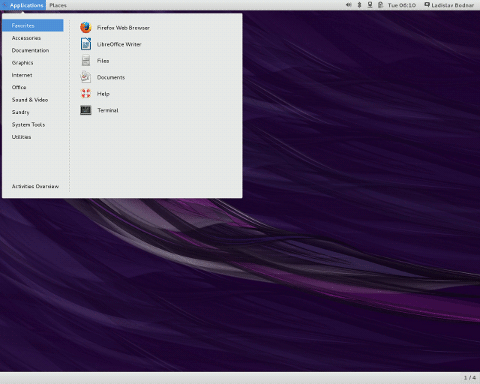 On the SL5 alpha live CD KDE is the default desktop. For the moment there are no 64-bit SL5 alpha live CD/DVD available." Read the short release announcement for more information. Download: livecd_SL5a_2007-01-17.iso (680MB, MD5), livedvd_SL5a_2007-01-18.iso (3,028MB, MD5). The Scientific Linux project has released a set of live CDs and live DVDs of the latest version of their Red Hat-based Linux distribution: "Scientific Linux live CD and DVD 4.4 have been released for both i386 and x86_64. Changes: update to Scientific Linux 4.4; update Unionfs to 1.1.5, Squashfs to 3.1-r2, NVIDIA driver to 1.0-8776; add SMP kernel to live CD/DVD (support for Dual-Core and multiprocessor systems); add r1000 and ipw3945 drivers; add more packages to the live DVD; add boot options: nopasswd, serviceon, serviceoff; live CD/DVD now runs with native Scientific Linux 4 kernel (no more special live CD kernel); live CD/DVD can boot from USB CD-ROM or DVD." Here is the full announcement. The release is available for download in the form of live CDs (i386 and x86_64), live DVDs (i386 and x86_64) and mini live CD (i386 only); quick links to the two live CD images: livecd_SL44_2006-10-22.iso (699MB, MD5), livecd64_SL44_2006-10-22.iso (686MB, MD5). The Scientific Linux development team has announced the availability of the fourth update of the distribution's 4.x series: "Scientific Linux 4.4 was officially released. We want to thank all those tested, re-tested, and worked with the developers. This release has several enhancements that wouldn't have been possible without everyone's help. We hope you enjoy the release. Scientific Linux 4.4 has several improvements over 4.3; these include: better support for wireless with MadWifi and the ipw3945 driver; fuse, fuse-smb, fuse-sshfs; and some scientific programs, namely CFITSIO, Numpy, and R. Scientific Linux release 4.4 is based on the rebuilding of RPMs out of source RPMs from Enterprise 4 AS, including Update 4. The release notes can be found here." Read the brief release announcement for more details. The 4-CD set of Scientific Linux 4.4 can be downloaded from the project's main server or its mirrors. Troy Dawson has released a set of updated builds of Scientific Linux live CDs and DVDs: "Scientific Linux Live CD 4.3 has been released for both i386 and x86_64. The Scientific Linux Live CD/DVD is a bootable CD/DVD that runs Linux directly from CD/DVD without installing. It is based on Scientific Linux 4. It uses Unionfs, allowing read-only file system to behave as a writable one and SquashFS providing on-the-fly decompression that allows storing 2GB software on a normal CD-ROM. The Live CD/DVD was built using modified scripts from www.linux-live.org." New in this release is an option to save files to a hard disk or USB storage device. See the release announcement for further details. Quick download links to the i386 ISO images: livecd_SL43_2006-05-17.iso (563MB, MD5) or livedvd_SL43_2006-05-17.iso (1,755MB, MD5). A new update to the 3.0 series of Scientific Linux, a distribution release built by recompiling the source RPM packages for Red Hat Enterprise Linux 3, is available for the i386 architecture: "Scientific Linux (SL) release 3.0.7 for i386 has been released. We wish to thank all the contributors, testers, and all those who have given us kind words of encouragement. The Scientific Linux community is great to work with and for. Scientific Linux release 3.0.7 is based on the rebuilding of RPMS out of SRPMS's from Enterprise 3 AS, including Update 6 & 7. There aren't too many improvements over 3.0.5 other than bug fixes, security errata and updated kernel modules. The release notes can be found here." Read the brief release announcement for more information. The 4-CD ISO image set of the new release can be downloaded from the distribution's main FTP server or its mirror sites. Connie Sieh has announced the release of Scientific Linux 4.3 for both the i386 and x86_64 architectures. This is the third update to the distribution which is built from source packages for Red Hat Enterprise Linux and enhanced with extra applications and features. Some of the enhancements include: APT, cluster suite, dropit, Global File System packages and its dependencies, IceWM 1.2.20, ksh, MP3 support in multimedia software, Ndiswrapper 1.5, OpenAFS, Performance Co-Pilot, and a number of other features and packages. For more details please read the complete release notes for i386 and x86_64 processors. The 4-CD set of Scientific Linux 4.3 can be downloaded either from the project's main FTP server or several mirrors worldwide. The Scientific Linux project, which rebuilds source packages for Red Hat Enterprise Linux (RHEL) into a complete RHEL clone, has released a live CD/DVD edition of their latest version for the i386 and x86_64 architectures: "The Scientific Linux Live CD/DVD is a bootable CD/DVD that runs Linux directly from CD/DVD without installing. It is based on Scientific Linux 4 It uses Unification File System (Unionfs), allowing read-only file system to behave as a writable one and SquashFS providing on-the-fly decompression that allows to store 2GB of software on a normal CD-ROM. The Live CD/DVD was built using modified scripts from Linux-Live." A mini live CD, a standard live CD and a full-blown live DVD are available for download; please see the release announcement for details and a list of download mirrors. Here is a quick link to the standard live CD for i386: livecd_SL42_2006-03-26.iso (695MB, MD5). Scientific Linux 4.2 for i386 and x86_64 processors is out: "Scientific Linux 4.2 was officially released. We want to thank all those tested, re-tested, and worked with the developers. This release might have taken longer than usual to be released, but it hopefully is one of the more stable. Scientific Linux release 4.2 is based on the rebuilding of RPMs out of SRPMs from [Red Hat] Enterprise 4 AS, including Update 2. Its biggest improvement over 4.1 would be the new yum 2.4, Yumex (a graphical front end for yum), and the various yum plugins." Find more details and links to release notes in the official announcements for i386 and x86_64 architectures. The two 4-CD sets are available for free download from this directory. Scientific Linux 4.1 for i386 is now available: "Scientific Linux 4.1 was officially released amid much fanfare and applause. The development team want to thank all the testers, all those that gave patches and suggestions, all those that contributed RPM's and packages, and everyone for their encouragement. All that support really keeps us going. Scientific Linux release 4.1 is based on...Enterprise 4 AS, including Update 1. Its biggest improvement over 4.0 is centrino wireless support, GFS and the cluster suite." The announcement is here. Scientific Linux 4.1 is available for download from the distribution's FTP server: SL.41.080405.i386.disc1.iso (627MB), SL.41.080405.i386.disc2.iso (629MB), SL.41.080405.i386.disc3.iso (639MB), SL.41.080405.i386.disc4.iso (350MB). Read the release note and check releases for other architectures on the mailing list. This is the fifth release of Scientific Linux 3.x series: "Scientific Linux (SL) release 3.0.5 for i386 has been released. Release 3.0.5 took a little longer than we expected, but it is finally here. We wish to thank all the testers, those who sent us patches and suggestions, and all those who have given us kind words of encouragement. Scientific Linux release 3.0.5 is based on the rebuilding of RPMS out of SRPMs from Enterprise 3 AS, including Update 5. Its biggest improvement over 3.0.4 is perhaps the addition of Firefox and Thunderbird, as well as newer, and hopefully better, kernel modules." Find more details in the release announcement and release notes. The four ISO image can be downloaded from this directory or from one of the mirror servers. Scientific Linux 4.0 for i386 is now available: "It should be possible to upgrade from Scientific Linux 3.0.x via the anaconda installer. Yum is known to NOT work. See SL.documentation for the vendor release notes... Rsync access available upon request." Read the announcement here. Scientific Linux 4.0 is available for download from the distribution's FTP server: SL.40.042005.i386.disc1.iso (597MB), SL.40.042005.i386.disc2.iso (631MB), SL.40.042005.i386.disc3.iso (644MB), SL.40.042005.i386.disc4.iso (367MB). The developers of Scientific Linux have released new development versions of their products for i386 and x86_64 architectures. The i386 edition is a release candidate, while the x86_64 edition is the first alpha build. Read the two release announcements (i386, x86_64) for further information and complete changelogs. The ISO images are available for download from the distribution's FTP server; here are the quick links for i386: SL.41.032805.i386.disc1.iso (591MB), SL.41.032805.i386.disc2.iso (627MB), SL.41.032805.i386.disc3.iso (647MB), SL.41.032805.i386.disc4.iso (246MB). This is the initial testing release of Scientific Linux 4.0, a distribution built from source RPMs of the recently released Red Hat Enterprise Linux 4: "This is the first release of Scientific Linux 4.x. It is an alpha release. Do not use it for production use. There may not be an upgrade path to future 4.x releases. It is not possible to upgrade to this release from anything else. This alpha is only for testing of new installs. There are no 'site' support yet. This release is made so that you can become familiar with Scientific Linux 4.x. See SL.documentation for the vendor release notes." Here is the full release announcement. Download: SL.41.022105.i386.disc1.iso (578MB), SL.41.022105.i386.disc2.iso (629MB), SL.41.022105.i386.disc3.iso (652MB), SL.41.022105.i386.disc4.iso (110MB). Scientific Linux is a Linux distribution built from source RPM packages for Red Hat Enterprise Linux. Version 3.0.4 for i386 and x86_64 processors has been released: "Scientific Linux (SL) Release 3.0.4 for i386 has been released. Thanks to all the testers and those who sent us patches and suggestions. Scientific Linux Release 3.0.4 is based on the rebuilding of RPMS out of SRPMs from Enterprise 3 AS, including Update 4. The release notes can be found here." This is the release announcement for i386. Quick download links for the i386 architecture: SL.304.021105.i386.disc1.iso (629MB), SL.304.021105.i386.disc2.iso (641MB), SL.304.021105.i386.disc3.iso (566MB), SL.304.021105.i386.disc4.iso (477MB).